I did get in my craft room to make some Easter cards this week but I didn't have enough time to post them. I made about 7 or so but some were repeats of last years designs. I only made a few that are new designs. The first one doesn't work for my challenge but it was fun to make! 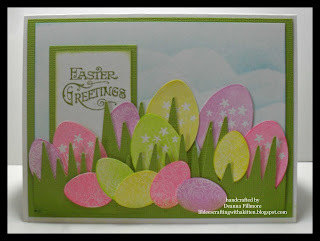 The eggs were cut out using the Easter 2010 cricut cartridge and I stamped them with versa color ink (canary, pink, lilac & lime) and studio G egg stamps. I also cut the grass out with the same cartridge and only glued it down at the bottom so I could place the eggs between layers. The greeting is from the crafty secrets Easter stamp set and stamped with peeled paint distress ink. I made a cloud template with the plastic from a spellbinders package and sponged the sky with tumbled glass distress ink. So this card will work for my challenge for a couple of reasons. The first is I used lots of patterned paper - from the basic grey porcelain line. I also used some ribbon (which was white and I colored with copic R00) and pearls, I'm not sure where they are from just random stuff from the oodles I have in my studio LOL. For the bunny I covered brown card stock with double sided tape and cut him out on the cricut using the Easter 2010 cartridge. I used white glitter for his eye and covered the rest of him with brown fun flock. The greeting stamp is from M's (it had a little chick on it that I cut off) I used memento rich cocoa to stamp it and colored it in with copic R00. The bunny and the greeting are popped up using 3d dots. I am so super busy right now, but last week when I was getting ready for a class I did manage to get a picture of my trusty assistant. 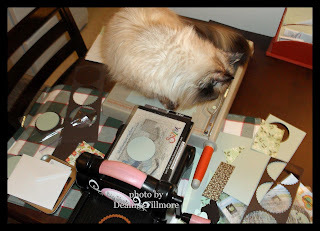 I always manage to create chaos in my studio when I'm cutting stuff up for a class, but this time it spilled over to my dining room too! The reason for this is my new cricut mini resides next to my computer and it is also in the dining room LOL. Once again Kit has found her favourite spot on the paper trimmer. I do believe it took me an hour or so to clean up my mess once I was done LOL. Oh well we had fun making the mess!!! 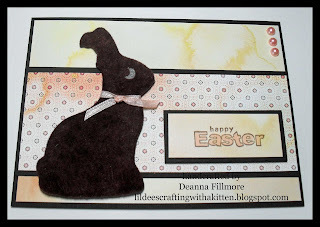 Time to get back to work, I will be back tomorrow with another Easter card. Have a wonderful holiday weekend everyone.